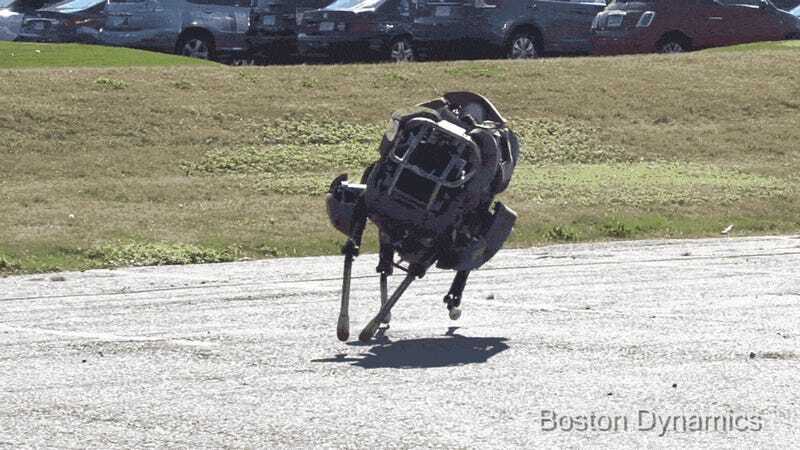 We learned Saturday that Google has purchased Boston Dynamics, the lab of mad scientists behind some of the most awesomely scary robots ever seen. What exactly did Google get out of the deal? An army of jaw-droppingly capable robots that can walk, run, and climb through seemingly any terrain. Let's meet the team. Boston Dynamics built the six foot tall Atlas search and rescue robot to compete in DARPA's Robotics Challenge. Unveiled this past summer, the 330 lb brute can walk on uneven terrain, avoid obstacles, run on a treadmill, and balance on one foot while being pummeled by a mini wrecking ball. It's awesome — and a bit terrifying. With laser rangefinders and stereo cameras for vision, hydraulically actuated aluminum and titanium limbs and fully articulated human-like hands, Atlas is envisioned as a humanoid hero who can walk undaunted into dangerous environments and perform crucial tasks. In 2014, six teams will program Atlas robots to compete in DARPA's search and rescue robot contest, inspired by the Fukushima Daiichi nuclear meltdown. Cheetah is Boston Dynamics' speed demon. Not only did it absolutely shatter the world speed record for legged robots, at a top speed of 28.3 MPH it runs faster than Usain Bolt. Funded by DARPA's Maximum Mobility and Manipulation program, Cheetah's blazing speed comes thanks to a design inspired by its namesake animal: the robot's spine flexes with each step, extending its stride length and allowing it to cover more ground. Thankfully, this beast is kept on a leash — the tethered power source means Cheetah can't run away from its creators. While Cheetah lives on the end of a power cord, WildCat packs a gas-powered engine that allows it to roam free in the wild. It's terrifyingly loud, and while the added weight slows it down in comparison to Cheetah, WildCat can still hit 16 MPH in a sprint. Like seemingly everything that comes out of Boston Dynamics' labs, WildCat is strikingly agile — watch how it leans into turns like a motorcycle. It's nimble, it runs as fast as you, and with a full tank of fuel it never gets tired. You do not want this thing chasing after you. This first-generation walking robot is a running, jumping, climbing mechanocreature whose movements are unsettlingly human-like. That's no accident — PETMAN was developed to test the durability of chemical protection suits used in hazardous environments, so its arms and legs move just like yours. Although you probably don't make the same creepy noises as PETMAN. Like Cheetah, PETMAN was an early developmental step. In other words, PETMAN is Atlas's robot daddy. And while Atlas by far the more muscular half of the family tree, dad's got some spry moves of his own. The brawniest of Boston Dynamic's bots is Big Dog, a mechanized pack mule capable of carrying up to 340 lbs. In development since 2005, the robot can climb a 35 degree incline, walk on ice, and maintain balance even when kicked. Originally designed to haul soldiers' gear in terrain too challenging for traditional vehicles, Boston Dynamics upped the ante this year by giving Big Dog a burly articulated arm. 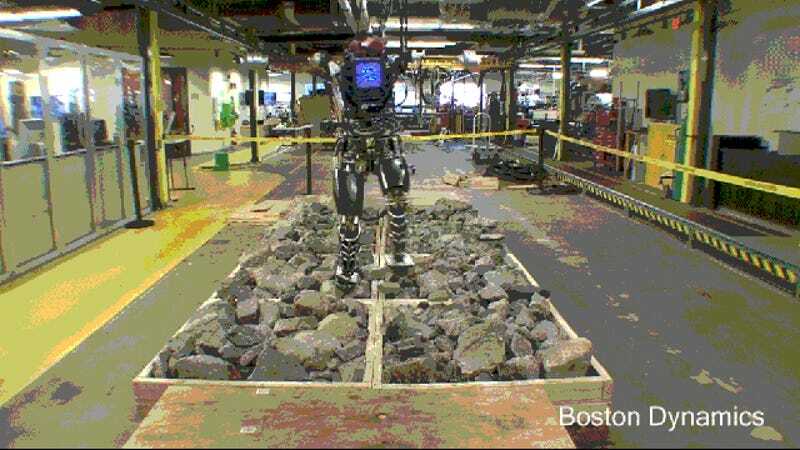 Watch how the robot tweaks its whole body to stay balanced while hurling a cement block. We doubt anyone's gonna go around kicking this robot now. Big Dog's even bigger brother LS3 carries 400 lbs and can walk up to 20 miles. Looks like a slightly chunky remote-control car, right? Maybe, but your kid's RC can't leap tall buildings in a single bound the way this little guy can. With a gyro-stabilized body that stays level during flight and an on-board camera, the 11 lb SandFlea jumps 30 feet in the air. This rolling and jumping bot could help soldiers and rescue workers get a look inside buildings and compounds from a safe distance away. With its big wheels, squat body, and astounding vertical leap, SandFlea looks kind of fun and friendly among its scary robotic cousins. Look at it go! Another of Boston Dynamic's high-mobility robots, RHex eschews wheels, legs or tracks in favor of curved paddles that help it get a grip on loose, uneven terrain. Each of the six legs moves independently, and the smart crawler adjusts its gait to maintain headway no matter the terrain. With a trio of cameras and lights up front and those floppy flailing legs, RHex gets your pareidolia going — it looks like a determined little critter trying to find a snack. Like a post-apocalyptic robo-ferret.